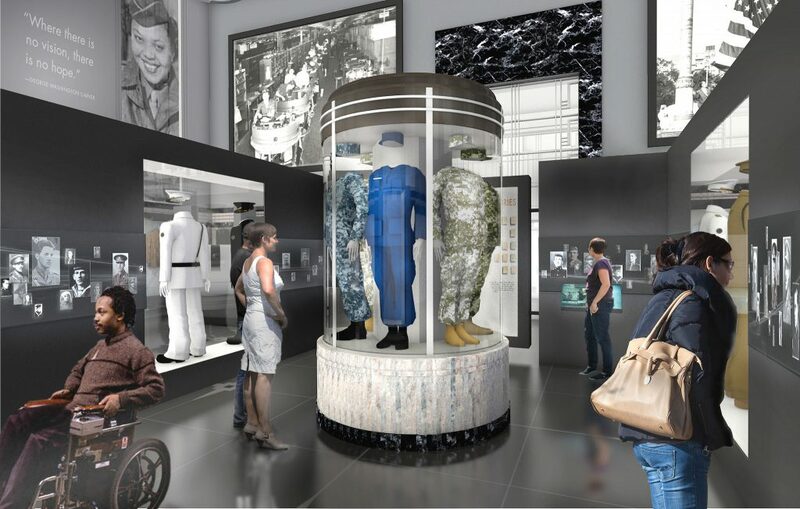 It’s been more than a year since an agreement was signed by the Missouri Historical Society and the City of St. Louis that set in motion a $30M transformation of the Soldiers Memorial Military Museum in downtown St. Louis. The long overdue renovation is being funded by private donations and will be maintained by a privately funded endowment. The city will continue to pay utility costs and the salaries of the museum’s two city employees. Admission will remain free following the renovation. 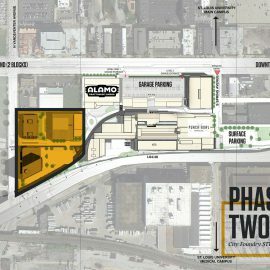 Now new renderings provide the clearest look yet at how the historic building will be preserved, the plaza as part of the Gateway Mall will be reimagined, and true accessibility for people of all abilities. 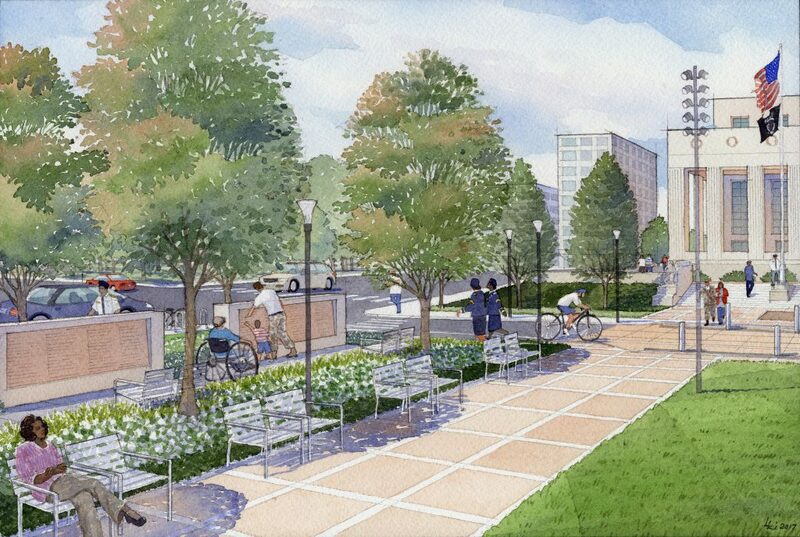 While ADA (Americans With Disabilities Act) requirements present a minimum standard, the design for Soldiers Memorial sought provide natural accessibility that didn’t feel like an add-on. To achieve this, angled ADA-compliant parking will be introduced around the site. A new ramp is included on the east side of the Memorial. 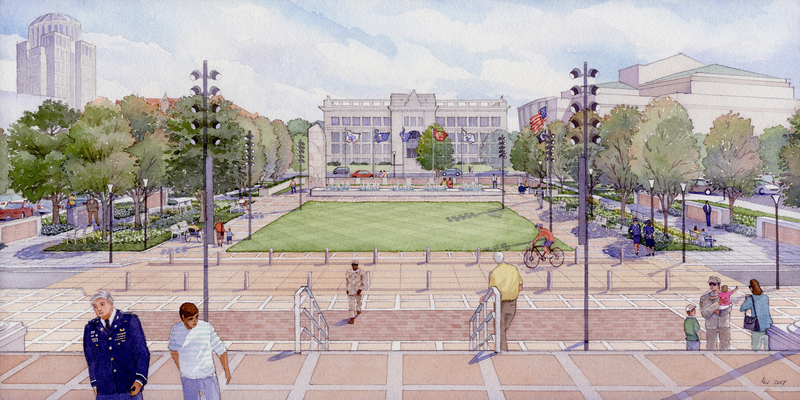 The connection from the Memorial to the Plaza is at-grade across a narrowed Chestnut Street. 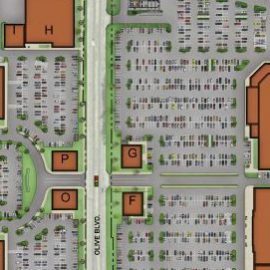 The street will be reduced from 42′ to 24′ and include a single drive lane and bike lane. 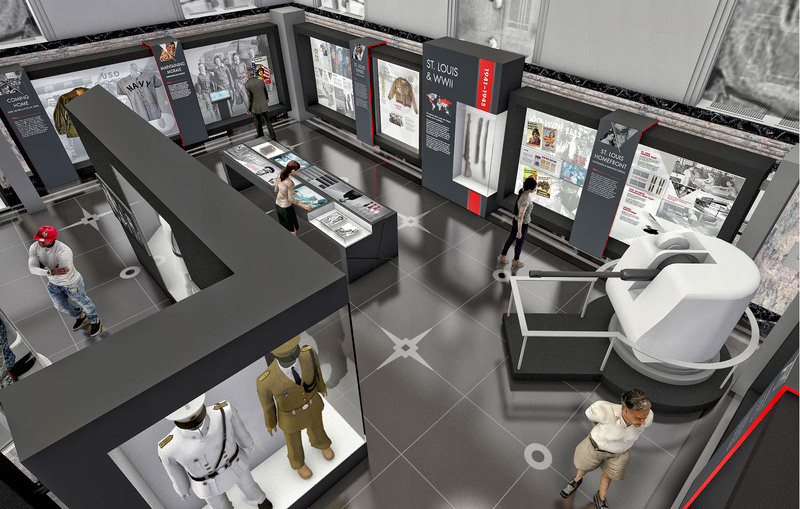 Inside, a new elevator and chair lift will enable access to multiple levels of artifacts and displays. Soldiers Memorial closed to the public in February of last year and is planned to reopen in 2018. 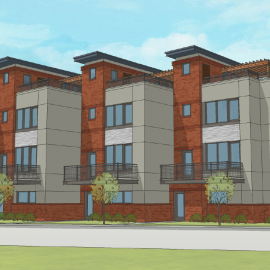 Mackey Mitchell Architects has led the design of the project. Renderings above are by Laura Linn. 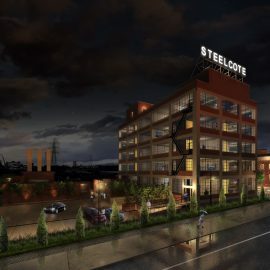 [dtls] landscape architecture studio has also contributed to the design of the project. Renderings below are by [dtls]. It’s a safe bet 95% of people reading this have never been inside the Soldiers Memorial Military Museum in downtown St. Louis. This is likely true of 99% of visitors and downtown workers as well. The museum, at 1315 Chestnut Street, occupying a city block bordered by 13th, 14th, Pine, and Chestnut Streets, is strangely easy to overlook among the monumental buildings along the Gateway Mall. The museum’s not only held a somewhat anonymous spot along the Mall’s most non-descript blocks, it’s existed in an uncommon civic and curatorial state. 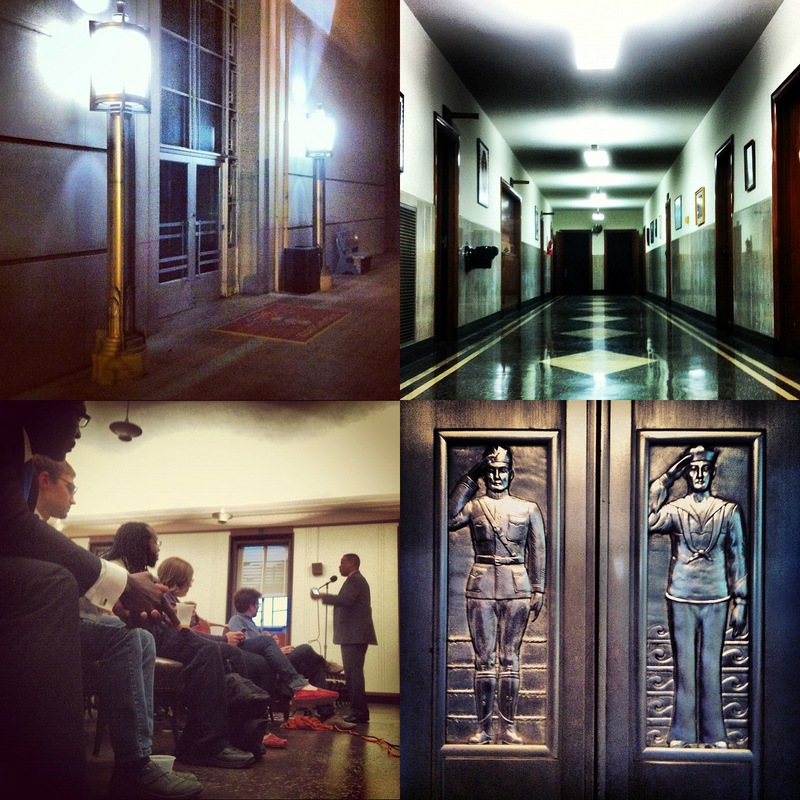 The building, and its contents, much of it donated by military veterans or their families, is owned by the City of St. Louis. Repairs have been deferred and donated items have piled up in boxes, uncatalogued and unpreserved. The building and museum are fascinating. We held a portion of the 2012 Open/Closed conference on vacant land in St. Louis in the building’s auditorium. The space was dated, but worked well for a screening of Detropia and an address by Jay Williams, executive director of the federal Office of Recovery for Auto Communities and Workers, and the former mayor of Youngstown, Ohio. Hopefully the space will remain available for private events. 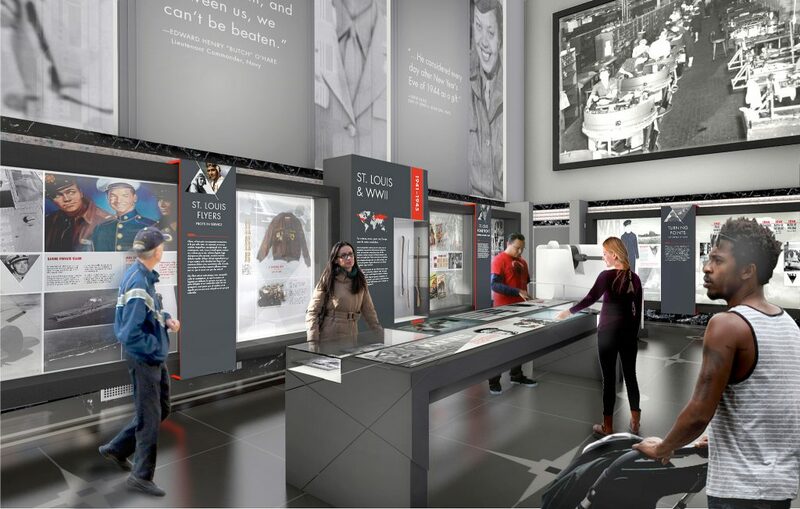 The Historical Society brings museum expertise to the site, and will manage all permanent and special exhibitions, among other museum responsibilities. The art deco building will be cleaned, made ADA compliant, have a new HVAC system installed, among other improvements. 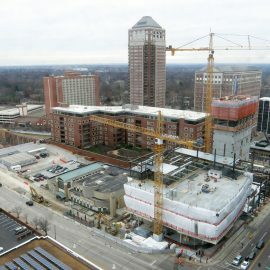 The lower level of the museum will become gallery space, more than doubling the current amount of total exhibition space. 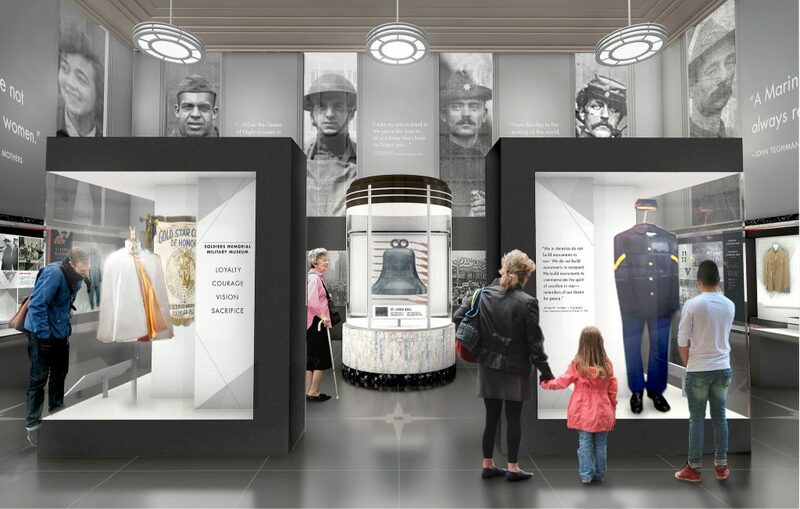 Along with the newly renovated and excellent Missouri Civil War Museum at Jefferson Barracks, St. Louis is becoming a destination for those interested in military history. The City of St. Louis created a Memorial Plaza Commission in 1925 to oversee the creation of the Memorial Plaza and Soldiers Memorial. Designed as a memorial to the St. Louis citizens who gave their lives in World War I, the Memorial became Project No. 5098 of the Federal Emergency Administration of Public Works. The St. Louis architectural firm Mauran, Russell & Crowell designed the classical Memorial with an art deco flair. St. Louis born sculptor Walker Hancock created four monumental sculpture groupings entitled Loyalty, Vision, Courage and Sacrifice to flank the entrances. 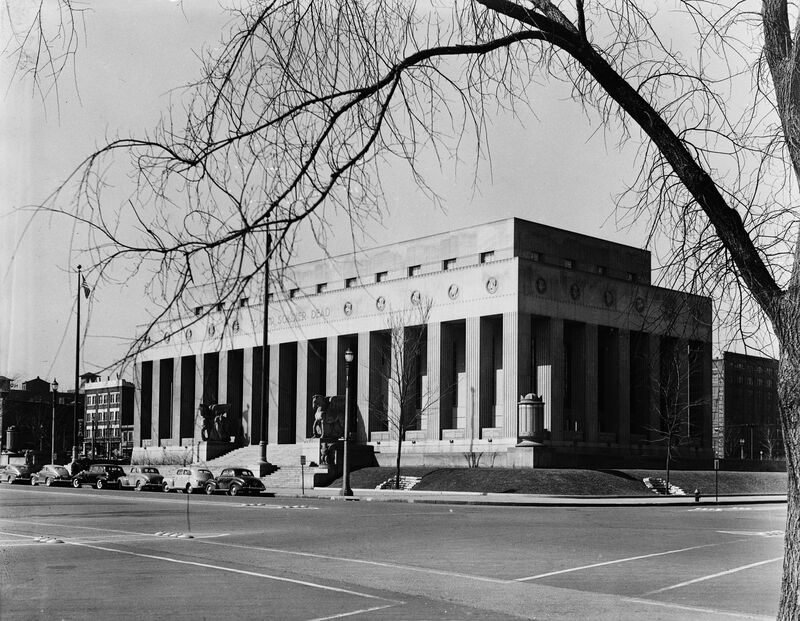 President Franklin D. Roosevelt dedicated the site on October 14, 1936 and the Soldiers Memorial Military Museum opened to the public on Memorial Day, May 30, 1938. The Soldiers Memorial Military Museum is owned by the City of St. Louis and is under the authority of the Board of Public Service of the City of Saint Louis. Today, the Soldiers Memorial honors all veterans and active military from St. Louis. Four monumental sculptural groups representing figures of Loyalty, Vision, Courage and Sacrifice by sculptor Walker Hancock stand, with their horses, on the north and south sides of the building. Other architectural sculpture here was completed by Hillis Arnold.